CORINNE JEANMAIRE & LAURANCE JOHNSTON, PH.D. Experts increasingly believe that stem cells have considerable potential to treat many of our most devastating disorders, including diabetes, heart disease, and variety of neurological disorders such as spinal cord injury (SCI). This article specifically covers the stem-cell program the Dutch company Cells4health (C4H) developed. Widely discussed in the Internet SCI community, this program attempts to restore some function after SCI through the transplantation of adult stem cells isolated from patient’s bone marrow. As discussed elsewhere, adult stem cells are found in numerous tissues, including bone marrow. Although they usually differentiate into specialized cells associated with the originating tissue, when certain cues are provided, they can differentiate into cells associated with other tissue. 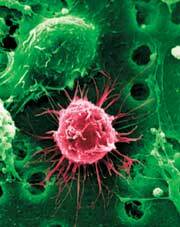 For example, under appropriate circumstances, bone-marrow stem cells can differentiate into nerve cells. The C4H program collects bone-marrow cells from the patient through a puncture in the iliac crest bone (the hip bone) in which a large quantity of bone marrow is concentrated. Because these cells are from the patient, they will not be rejected as can be the case when the transplanted material is obtained from a genetically different donor. According to C4H CEO Dr. Cornelis Kleinbloesem, the extraction is a relatively simple, painless procedure (using local anesthesia when needed) with no side effects. The isolated stem and other bone-marrow cells are processed through a proprietary process, which Kleinbloesem claims is a key factor in the program’s success. The cells are then injected into the patient’s spinal cord at the lesion area through 20-40 microinjections. Cumulatively, about two-milliliters of the stem-cell preparation, corresponding to about 10-20 million cells, are injected above, below, and around the injury site using an insulin needle. Carried out under total anesthesia, the procedure requires a laminectomy at the lesion level and the opening of the cord’s dura membrane. In the future, Kleinbloesem speculates on the possibility of using computer-assisted, neuro-navigation injections. The company is also considering the less invasive intrathecal transplantation of cells directly into the spinal-cord fluid. This is not an insignificant change because the site of transplantation (i.e., the cord itself or spinal-cord fluid) may profoundly affect outcomes one way or another. Although patients with any injury or at any age are potential candidates for the procedure, those whose cord has been transected or atrophied are not currently eligible. Kleinbloesem believes that this exclusion may be dropped in the future by using a stem-cell-containing gel to bridge the spinal-cord gap, similar to what other programs have done. The company also may incorporate neural growth factors in such a gel to enhance regeneration. Of the nine patients with chronic SCI treated in the first half of 2005, eight reportedly have had positive results. In three of the first four treated in February, 2005, MRI imaging indicated that the lesion size was reduced by half three months after surgery, data suggesting the creation of new neural cells and supporting structure. As gleaned from several sources, cell transplantation appeared to have restored significant function and sensation in three of these four initial patients. Two to three months after transplantation, the first patient, who sustained a T6-complete injury four years earlier from a car accident, reportedly recovered function to the T12- L1 level and was able to move legs, walk a few steps using a walker, and stand. The second patient, who had sustained a complete cervical-level C5-6 injury seven months earlier, a month and half after surgery was said to be able to move legs and fingers and feel toes, and regained rectal and bladder sensation. Several months after transplantation, the third patient, who sustained a complete C5-6 injury nine months earlier from a surgical complication, reportedly regained his ability to stand, ambulate using a walker with leg braces, and write. Also, his sensation returned to near normal, and he regained rectal control. The fourth patient accrued no benefit, perhaps because his spinal cord turned out to be transected. Five additional patients had the procedure in May 2005 and, according to C4H officials, at the time of this report, they regained some promising sensation, which Kleinbloesem predicts will be the precursor of restored function. Although too early to report on results, additional patients were treated in the latter half of 2005. For patients considering the procedure, it is important to underscore that many of the results were, in fact, reported by C4H, a for-profit organization and not scientifically verified by independent sources. C4H is a Dutch holding company with international affiliates and professional associations and whose core competence resides in the extraction, processing, storage of adult stem cells for therapeutic applications. Concerning SCI, the company coordinates and subcontracts the necessary expert functions regarding cell implantation. To date, C4H has used Turkish medical facilities and neurosurgeons. The patients stay in the hospital approximately 10 days, a period that includes the extraction of cells from the patient’s hip, cell processing (done in a United Kingdom facility), cell implantation, and a few days for post-surgical recovery. C4H coordinates all logistic aspects in Turkey. As of January 2006, cost of the procedure is 16,500 Euros (~$21,000), excluding travel and related expenses. The C4H stem-cell program for SCI is one of many emerging throughout the world. Although the emergence of these programs is certainly a promising sign, questions remain concerning both safety and effectiveness. As such, candidates for such procedures should carefully weigh, relative to their unique situation, potential benefits that may accrue against the inherent risks associated with any invasive surgery, as well as, to date, poorly understood, unanticipated stem-cell risks. Stem-cell transplantation procedures vary substantially in many respects from program to program, and, as a consequence, so can results. When it comes to function-restoring stem-cell programs, the devil will be in the details. In addition to the C4H website www.cells4health.nl/health-spinalC/en/, the program has been extensively discussed on the CareCure website http://carecure.org. Adapted from article appearing in March 2006 Paraplegia News (For subscriptions, call 602-224-0500) or go to www.pn-magazine.com).